The second phone based on Google’s operating system Android has been pulled out of the bag by Vodafone as the Mobile World Congress in Barcelona continues to pepper the landscape with new handsets galore. 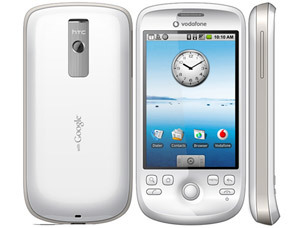 Known as the HTC Magic, the phone sports the same curious ‘chin’ of its predecessor, the T-Mobile G1, but does away with the keyboard – which for us, is a real deal buster (the phone will instead feature the new ‘Cupcake’ Android feature which offers a virtual onscreen keyboard). The HTC will be powered by Qualcomm MSM7201a, 528MHzprocessor and offer 512MB ROM and 192MB RAM memory with microSD memory card expansion. The battery life – which proved so disappointing with the G1 is rated at 400 mins/450 mins talk time (WCDMA/GSM), with standby times of 660 hours/420 hours for GSM), thanks to the upgraded 1340 Li-Ion 1340 mAh battery (up from 1150 mAh). The handset’s a good looker, but not exactly slim at 4.45 x 2.17 x 0.45-inches and weighs in at 4.18 ounces with battery. Stupidly, HTC have stuck with their non-standard audio jack instead of the 3.5mm jack that every single person on the planet prefers. There isn’t that much to get excited about on closer inspection – the camera is only a 3.2 Megapixel job with no flash, and the capacitive touchscreen remains at 320×480 HVGA resolution. As before, there’s Bluetooth, WiFi, mini USB, and GPS functionality on board – plus the digital compass, which we love! 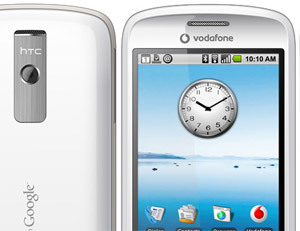 Vodafone will be announcing pricing and availability depending on the market. So far, we’ve heard that it’ll cost between 99 to 199 Euro in Spain, depending on contract, with a UK release date in April.